Norm’s Farms reached out to me to see if I would be interested in reviewing their products that are made with elderberries. I love the health benefits of elderberries, so, of course, I was interested. You can also get 1 of everything they manufacture by buying their sampler pack. There is no way for me to truly know the antioxidant benefits without being on a trial with blood work and what not. So, let’s first talk about the taste. I was very impressed with the taste. Although Norm’s Farms says it’s not a “ready to drink” beverage, I beg to differ. I have no issues with the taste whatsoever. But if need be, you can always add it to some orange juice, as I do in our final review video below. I love the packaging. It is hip – just like their website and everything arrived to me in the mail safe and sound. There is just something wonderful about a glass bottle too…something that plastic just can’t match. I have been very impressed with my experience with Norm’s Farms. I asked Ann, one of the company’s owners, if I could ask her some questions for the review. She didn’t hesitate and sent me her responses. You can see our exchange below. Your bottle says that your Elderberry Extract is made in North Carolina? But the farm is in Missouri? So are the elderberries grown in Missouri or North Carolina? Elderberries are grown on our farm in Missouri and on our small plot of land in North Carolina…that’s why we are called Norm’s Farms! Although we’d love to be able to grow all the elderberries we need, we are also buying elderberries from other family farmers. The past three years of summer weather in Missouri has been pretty hard on the elderberry orchard and harvests have been poor, and we simply don’t grow enough in North Carolina to meet our needs. We recently purchased a good quantity of beautiful, naturally grown elderberries from a grower in Canada, and we are developing relationships with start-up elderberry farmers throughout the US to ensure that we have a supply of elderberries grown without the use of herbicides and pesticides. Many of the farmers we talk to have been struggling with the crazy weather…extreme drought followed by extreme flooding, and elderberries are not immune to either. We are praying for a “Goldilocks” summer this year for all farmers; not too hot, not too cold, not too wet, not too dry…just right! Farmers really need a break from climate change this year. Why would someone want to take Elderberry Extract? Elderberry is an old-time remedy for cold, cough, flu, and sinus infections and was used throughout the ages to treat a variety of other ailments too. Elderberry used to be known as “the medicine for the common people” and was considered one of the “must have” plants for the home garden. The folk wisdom associated with elderberry had all but disappeared in the last century as people abandoned the wisdom of their grandparents for the new and shiny promise of modern medicine. Modern medicine and the pharmaceutical market have developed many amazing drugs and procedures that have lengthened life expectancy and provided cures to diseases that used to kill us. There have been many mistakes made along the way, too, and we, as a people, have come to be wary of the side-effects associated with today’s modern pharmaceuticals. For some ailments we are re-discovering that the best way to restore our health can be found in the practices of our ancestors: eating whole foods grown naturally and turning to nature for remedies whenever possible. As an example, there are many “over the counter” pharmaceutical remedies for relieving the symptoms associated with cold and flu but as it turns out, none of them, not even Tamiflu, are as effective as elderberry! The plant has many scientists so intrigued that they have applied for and received large research grants in order to uncover the mechanism(s) that give elderberry its anti-viral and health promoting properties. Elderberry seems to boost the immune system, too. For that reason, people with auto-immune diseases should consult with their doctors before taking elderberry, as it may exacerbate the symptoms associated with an auto-immune disease. What’s the recommended daily intake and why? Folk wisdom says that one ounce (2 tablespoons) of Elderberry Extract is the recommended daily serving for general immune system support. There are good reasons not to take more than that. Elderberry has diuretic and laxative properties and each person needs to watch how their body reacts to elderberry and adjust accordingly. Most people have no trouble with one to two tablespoons a day. Interestingly, a recent study* conducted by the University of East Anglia Norwich Medical School found that people who regularly consumed foods high in flavones, specifically anthocyanins, were far less likely to develop type 2 diabetes and other diseases associated with inflammation. Another study** found that people who ate foods high in anthocyanin content reduced their incidence of heart attack by 33%! If I am sick, should I take more? Elderberry is most effective at combating colds, flu and sinus infections if you begin taking it at the first sign of symptoms. At our house, we’ll consume as much as 4 ounces over the course of one day when we first notice the symptoms, and usually feel completely well in about 24 hours. Again, each person should start with one or two tablespoons a day and find out how their body reacts to it before increasing the serving size. 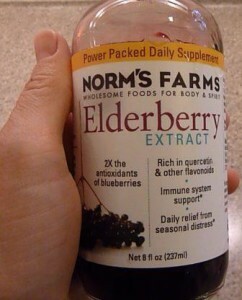 If I am sick, will the Elderberry Extract be just fine, or should I have the Elderberry Wellness Syrup instead? We think or our Elderberry Wellness Syrup as the perfect comfort medicine for those times when we are sick. We chose the ingredients in the syrup carefully; elderberry is anti-viral, honey is great for relieving sore throats and calming coughs, cloves are a natural analgesic, and cinnamon is a natural antibiotic. 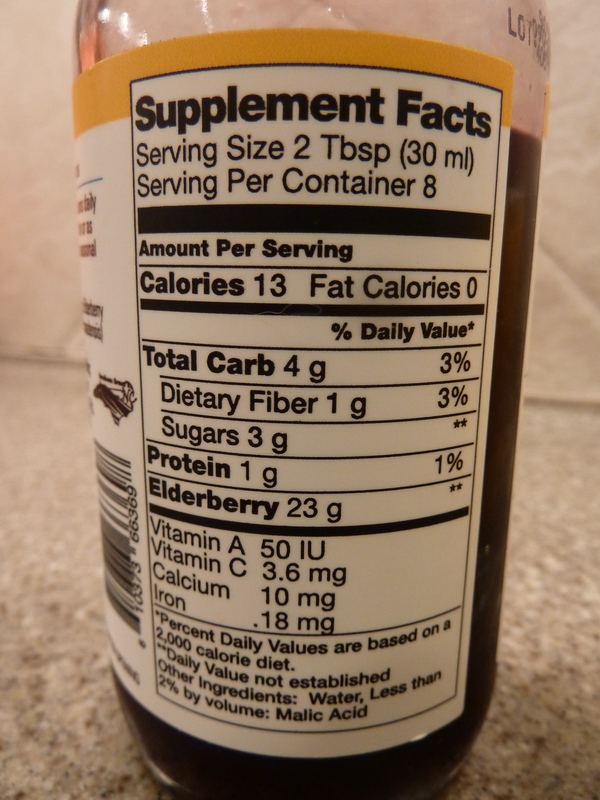 *** By volume the Wellness Syrup is about 1/3 elderberry, which means you can take more of the Wellness Syrup than the Extract in any given day. We recommend mixing an ounce of Wellness Syrup in a cup of hot water to make a great tea…so soothing on sore throats and helps open up the sinuses, too. All of that said, the extract works just fine, too! Do you drink your Elderberry Extract? How much and how often? Elderberry Extract is not a “ready to drink” beverage all by itself, but it is a great ingredient in many amazing beverage recipes. Mixing it into sparkling water, hot or cold tea, adding it to your favorite smoothie or juice recipe, or mixing it with sparkling cider are all great options. Try mixing a tablespoon of Elderberry Extract in your favorite juice (orange- mango is ours! )…for a colorful and delicious morning drink. 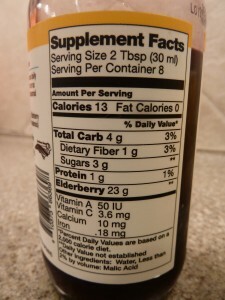 What are some of the ways your customers use the Elderberry Extract product? We love it when customers tell us the fun and inventive ways they have found to use Elderberry Extract! We’ve been told that a tablespoon of Extract poured over strawberry ice cream is amazing, and people have sent us pictures of our Extract drizzled over their morning bowl of oatmeal. One of our customers wrote to us this morning to tell us of an amazing teriyaki glaze they made with our Elderberry Extract. One of the fun things I do every month is develop recipes that use one of our 5 elderberry products, and my creations using the Extract include glazes, sauces, juicing recipes, and salad dressings. Any tips on how to get Elderberry Extract stains out of your clothes? Elderberry is completely water soluble! All you need is a little soap and water to remove Elderberry Extract from your clothing. What is a water extract method? Why do you use it? The water extract method is simply using a bath of gently heated water to extract the juice from the berries. We use that method because it’s the simplest, cleanest, purest way to extract juice from an elderberry. Because an elderberry is very small, and about 50% of each berry is a small, hard seed, we can’t use the press method: the seeds clog up the press and shut the press down. Other extract methods include a steam method (which requires heating the berries to 400 degrees), or using alcohol or some other chemical to pull the juice out of the berries. What is erythorbic acid? How do you preserve your products? Erythorbic Acid used to be known as “isoascorbic acid” and contains all the same molecules as vitamin C, but the molecules are arranged differently. It is most commonly derived from vegetables, specifically the sugar within the vegetables. It is widely used as an antioxidant in processed foods to retain color (prevent the food from turning brown, a natural result of oxidation). We chose to eliminate it from our recipe because a) it is most likely made from either sugar beets or corn, both of which are most likely to be GMO, and b) because our supplier can no longer guarantee that the Erythorbic acid we buy is NOT made from corn, which presents a real problem for people with corn allergies, and c) because we make our products in small batches that are sold and consumed within a month of two of processing, we don’t have to worry about oxidation. We bet that people would prefer to not have that ingredient in our recipes and to confirm our hunch we surveyed our customers just last week. When asked how they felt about the recipe change (removing the Erythorbic Acid) 81.5 % of respondents chose “I’m happy!”, 7.89% chose “I feel somewhat positive about it”, 10.53% chose “I don’t have any feelings about it one way or another”, and 0% chose the last two options which were “I feel somewhat negative about it” or “I don’t like it.” Our customers want simple, real food with the fewest number of added ingredients, and, as consumers of food ourselves, we completely agree! We derive a great deal of pride and satisfaction from being able to create the best tasting, most natural elderberry products on the market! Elderberry juice is not naturally acidic. For food safety reasons we need to add an acidifier in order to produce a product that can be bottled and stored and be safe for consumption when that bottle is opened. We played around with a lot of different acidifiers and rejected lemon juice because it altered the flavor of the elderberry extract too much, and of all the powdered acidifiers we could choose from, malic acid seemed the best. It is derived from apples, and is the least tart of all the acidifiers available, so it allows the flavor of elderberry to shine through. Buy Norm’s Farms Elderberry Extract. 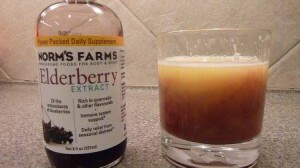 We received the Norm’s Farms Elderberry Extract for review from the manufacturer. Receiving the free product did not influence this post.